From the first interview with your buyer prospects to the opening of your car door, have you done the right planning for your showing day? Are you showing them FSBO's as well as MLS listings under a buyer representation agreement? Do you have a firm grasp of their requirements? Have you made a final check of the recent MLS activity (hot sheet) to be sure that all of today's homes are still on the market and are at the prices you have with you? Don't start out wrong, have your planning done for a successful showing day. Even if you have to drive the entire route the day before, be sure that you can take the most direct route to each home in turn. Your buyer clients are hiring you as the expert in the area and the properties listed there. Don't damage that expectation by driving around unable to locate a street that's been there for ten years or more. There's no such thing as too much information when you're showing homes to real estate buyers. If for no other reason, having things like floor plans, survey plates, and restrictions documents, you'll be able to answer questions they're sure to ask. If it's their first time in a subdivision, some information and covenants from the subdivision would be a great thing to have in their packet. You have your printouts and they should have their own copies with a clipboard and pen for taking notes. Even a map of the area for them to keep would be a nice touch. I once showed a home, and even though I did knock and announce myself, I opened a bedroom door to find a teenager asleep home sick from school. Others have surprised a homeowner in their robe having coffee. Be sure to knock loudly and announce your presence on entry, even if the occupant is supposed to be away. On one entry, I did my usual loud "Hello, Realtor!" announcement and heard "Hello" back. I didn't enter. "Hello, Realtor!" again and "Hello" back. He really was a very friendly parrot. On this subject, it's also best to go to the door, knock and gain access before walking the yards. If there is an owner or tenant at home, you want them to know that you're there before they see you through a window in their backyard. With security being a big issue, most MLS lockbox systems now have a requirement that the access key is updated either monthly, weekly or daily. Make sure that yours is ready to use. Also, check or replace the batteries and carry spare ones at all times. It's a bit embarrassing to be unable to access the key a listing. While we're on the subject, put the key back in your pocket or it's pouch on your belt before you go in. Leaving it in the home and locking up will ruin an entire showing day. Disagree if you like, but your role is to facilitate the location of properties, present them to your buyer clients and answer their questions/do research to help them make decisions. Your role is NOT to sell them a home. If you hear an agent or broker complaining that a significant number of his "deals" fall through before closing, it could be that too many "closing techniques" are being used and they're experiencing "buyers' remorse." There are a good number of ways a buyer can balk on a contract without just saying "You pushed me too hard, and I've changed my mind." Agent forums see this question frequently; "Do you lead your buyers through the home pointing out features, or do you just let them find their way and stay behind them?" If your buyers express that they'd like you to lead them around, then do it. Otherwise, they'll probably appreciate your presence to answer questions without too much feature-pointing. If you've developed a good relationship, your comments are probably appropriate, however, you don't have to like or dislike the home....they do. Definitely, point out problems you might see. Cracks in walls or floors, as well as mold or watermarks, are things you should bring to their attention. They still may like the home, but they'll need to get disclosure and inspection of these items if moving to purchase. Too many homes are full of really interesting "things". It's easy for some buyers to get side-tracked looking at pictures, furniture and other things that aren't part of the home for sale. You need to keep your schedule and your buyers in the "home" mode, rather than the "things" mode. One effective way to move them out of a room they've gotten too comfy in would be to precede them into another room and make some exclamation like "Wow, this is a nice room!" It's also OK to let dawdling buyers know that you have a schedule and need to keep moving. 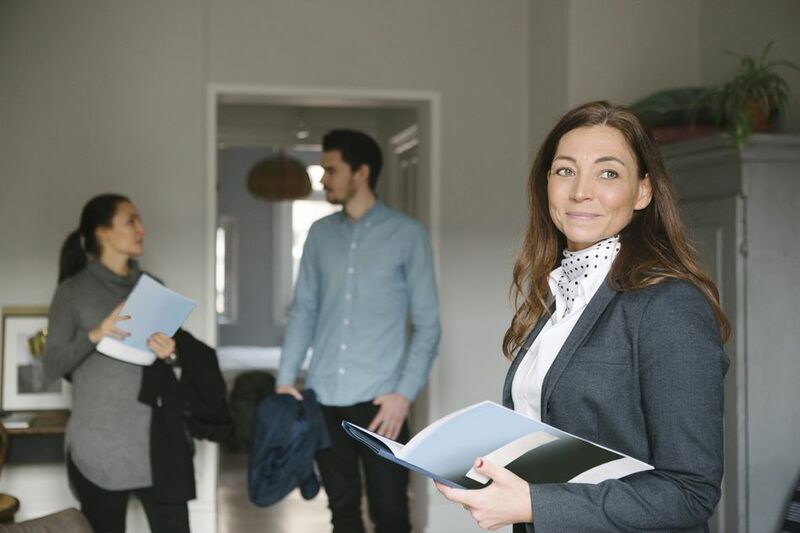 If their excessive time in a home is genuine interest, you can ask them if they'd like you to schedule another showing to get more in-depth information on the property. Be sure to leave the home exactly as you found it. That means doors that were open should be open and closed if they were closed. Make sure that all exterior doors are locked. If your buyers separate during the visit, and you can't be with everyone, then go through the home once they're out and do a last check of all doors and rooms. The only time many agents have been bitten by this is when they were with one buyer and the other unlocked the door to check out the bedroom deck. If you don't follow behind them all at the end, you could leave an unsecured home. You've shown a dozen or so homes and you've been careful to enter properly and lock them up when you left. You've answered a lot of questions and driven around a bit. Don't expect that you'll remember everything, or that your clients have the same thoughts about a home as they had when they were in it. Over coffee, or just in the car, go over each of the homes and get their opinions and perhaps their final "no" to each. Ask if there is any follow-up on particular homes they'd like you to do. Maybe they now would like to see one of them again, and you can schedule a return visit. Do this review when you're not moving and can take notes. In keeping with your consultant expert image, always write down important information...which is what your clients expect. Does a Real Estate Broker Need an Office? How Much Do You Need to Know to Invest in Real Estate?